Use this screen to add cloud services to the system. A fresh OTRS installation doesn’t contain any configured cloud services by default. The cloud service management screen is available in the Cloud Services module of the OTRS Group Services group. Click on the Activate SMS Cloud Service button in the left sidebar. The following settings are available when adding an SMS cloud service. The fields marked with an asterisk are mandatory. 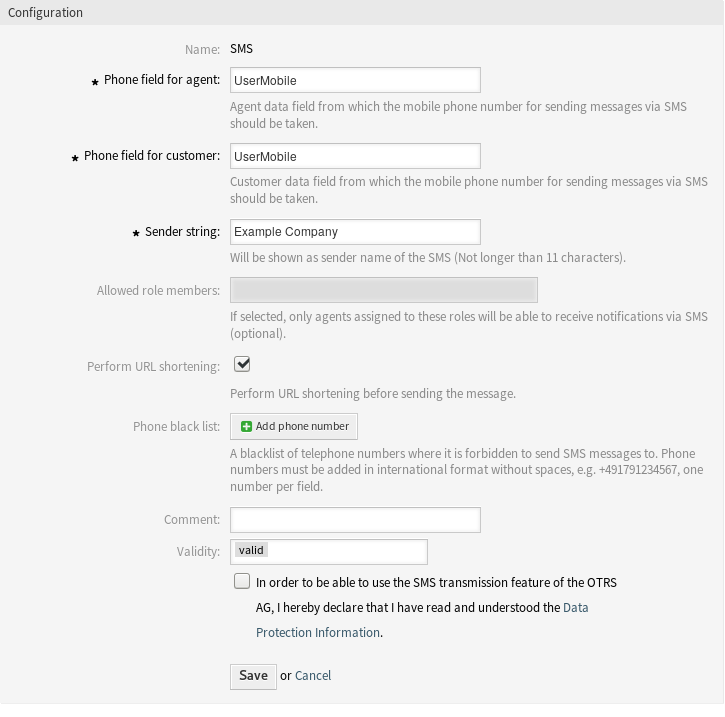 Agent data field from which the mobile phone number for sending messages via SMS should be taken. Customer data field from which the mobile phone number for sending messages via SMS should be taken. Will be shown as sender name of the SMS (Not longer than 11 characters). If selected, only agents assigned to these roles will be able to receive notifications via SMS. Perform URL shortening before sending the message. A blacklist of telephone numbers where it is forbidden to send SMS messages to. Phone numbers must be added in international format without spaces, e.g. +491791234567, one number per field. In order to be able to use the SMS transmission feature of the OTRS AG, the Data Protection Information needs to be read and understood.